Connor Alfred Barwin who is often called Connor Barwin is an American football player who was drafted by the Houston Texans in the second round of the 2009 NFL Draft. He formerly played as a defensive end for the Philadephia Eagles and the Los Angeles Rams but is currently signed up to the New York Giants as an outside linebacker. Despite being deaf on his left ear, he has bagged a lot of achievements and has also attained a Pro Bowl to his name. Let’s meet Connor. Connor Barwin was born on October 15, 1986, as the youngest of four brothers to his parents in Hazel Park. He was born with a hearing defect which was not confirmed until the age of two. As soon as he was diagnosed, his parents decided to carry out measures in order to rectify his condition which led to a series of surgeries until the successful removal of a benign tumor found near the ossicles. After the surgery, it was expected that the hearing defect would have been corrected, unfortunately, only his right ear was whole while he could only hear about 10-15 percent with his left hear. Due to his hearing disability, a lot of fans have been in awe over how he plays excellently well on the field without losing his balance. As a child, he loved the Detroit Lions and cheered them whenever they played. He also had a special likeness for Barry Sanders who played as running back for the team. Barwin had his high school days at the University of Detriot Jesuit High School after which he attended the University of Cincinnati where he majored in history. Naturally, he loved sports and was engrossed with the game of basketball and football. As a matric at Cincinnati, he acquired the All-State selection, All-League, All- Catholics and All-District honors in football. Just like he gathered awards in the game of football, he also did in the game of basketball as he also earned the All-League selection honors as a junior and as a senior he earned the All-Catholic honors. In his first year at the University of Cincinnati, he played in 11 games as a backup tight end and totaled 8 receptions for 144 yards in addition to a touch down in 2005. While in the second year, he played 13 games and finished with 13 receptions for 148 yards in addition to 2 touchdowns. He became a junior in 2007 and recorded 31 passes for 399 yards in addition to 2 touchdowns, with that, he ended his tenure as a back up tight end and was moved to the defensive end position. As a starter on the defensive end, he wowed his audience and completed the season with 53 tackles, a big east, team-leading 12 sacks, 20 quarterback pressures, eight pass deflections, three fumble recoveries in addition to three blocked kicks. At the end of his college career, he totaled 16 starts in 51 games attaining 66 tackles, 12 sacks, three fumble recoveries, eight deflected passes, five blocked kicks in addition to 53 receptions for 692 yards and six touchdowns. Connor Barwin’s professional career started with the Houston Texans in 2009 after he emerged as the 46th overall pick of the NFL Draft that year. Throughout the season, he played in 16 games and finished with 16 tackles, 4.5 sacks and 4 passes playing on the defensive side. He sustained an ankle injury and was placed on the disabled list which kept him out throughout the 2010 season. The footballer returned in 2011 and recorded a career-best 10 tackles and 4 sacks in a 20-13 victory against the Jacksonville Jaguars. To crown his achievements that year, Conor was rewarded with the AFC Defensive Player of the month in November 2011. By the end of the season, he had recorded 49 tackles, 11.5 sacks, 7 passes defense, and a fumble. The following year; 2013, Barwin signed a six-year contract worth $36 million which had $8 million guaranteed with the Philadephia Eagles. Having signed the contract he began doing exploits during his first season with the team and totaled 82 tackles, 12 passes defense, an interception, and a fumble. His archive of achievements increased as he earned the Associated second-team All-Pro honors and also acquired his first Pro Bowl Honors in 2014. All through 2015, he played in 16 games and finished with 54 tackles, 7.0 sacks, one forced fumble in addition to 8 passes. Connor Barwin continued at an excellent pace and by 2016 he was named the NFC Defensive Player of the Month for November as he recorded 6.5 sacks, 24 tackles, 2 batted passes and a forced fumble that month. By the end of 2016, he played 16 games where he totaled 34 shackles, 5.0 sacks, one forced fumble, and two passes defense. Connor signed a year contract with the Los Angeles Rams in 2017 worth $6.5 million, he completed the contract and further sealed a two year deal with the New York Giants worth $5 million on July 23, 2018. Connor Barwin’s parents are Margaret and Tom Barwin. Apart from his parent’s names, he has withheld other details from the spotlight but from the little we know, his parents were his source of encouragement. They stood by him through thick and thin and has shown him an immeasurable amount of love. We also know that he comes from a family of six consisting of four boys and Connor is the youngest of the quartet. He is married, he married his longtime girlfriend Laura Buscher. He met Laura in 2012 and they dated for four years as their relationship went smoothly and further blossomed to an engagement done on the Christmas of 2016. They finally officiated their union on the 29th of April 2017. Sometime in December 2017, the footballer uploaded a video on his Instagram page insinuating that they were expecting a child-a boy. Afterward, no one heard any more from them until when he uploaded an Instagram picture of their child while taking a shower on June 15, 2018. His post on the picture stated that the child was just two weeks old. 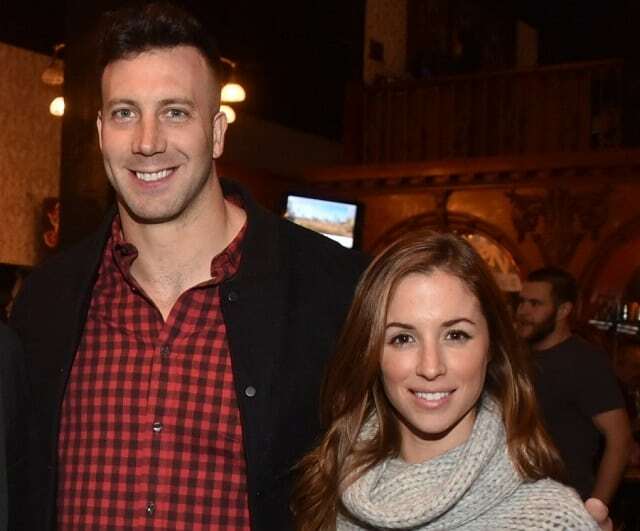 With Connor Barwin playing as a defense, we wouldn’t expect anything less when it comes to his looks. Evidently, he has a strong frame and possesses an athletic body build. He stands at 6 feet 4 inches with a balanced weight of 119.7 kg.